How do I add a list of users to request reviews from in GetYour.Reviews? Step 2) Click on 'Invites' at the top. Step 3) Next click on ‘Upload CSV’ at the top-right. Step 4) You can download an example file that you can fill out by clicking on the 'Download a sample here.' link. Step 5) You can edit the file in Excel, just ensure to save the file as a .csv file type (eg. mylist.csv). Leave the first row and add users email address, first name, last name in the lines below. You can ommit the phone_number field as well. Step 6) Once you are done creating your list click on 'Browse...' in GetYour.Reviews to upload your list. Step 7) A pop up window will display to let you review your uploaded list. If everything is correct you can click on the 'Upload' button. If your list is long you may have to scroll down to access the 'Upload' button. Step 8) You should see the Pending recipients list display your list of users shortly (may require a page refresh). 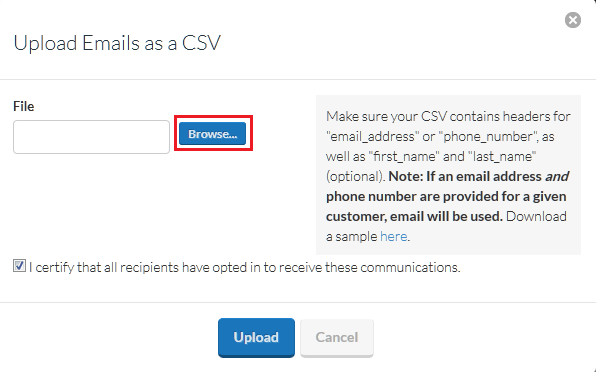 Step 9) Ensure the 'Auto-activate pending recipients daily?' is set to yes and you can also adjust how many emails are sent per day. To edit either field just hover over the value and then click on the pencil to the right of that field to edit.